19th Century Irish Genre-Painter: Biography, Paintings. Born in Dublin, Richard Thomas Moynan first studied medicine but changed his mind when he was 23 and switched instead to art, studying drawing, figure drawing and painting at the Dublin Metropolitan School of Art (now the National College of Art & Design) in the autumn of 1879. Here, he won awards in both the Taylor and Cowper competitions, then in 1882 he moved to the Royal Hibernian Academy, where he scooped both silver and bronze medals for his artwork. He followed this achievement by winning the Albert Scholarship for the best history painting (The Last of the 24th at Isandula, 1883) displayed in the RHA by a student. In 1883, like other Irish artists Walter Osborne, Nathaniel Hill, and Joseph Kavanagh, Moynan went to study art at the Academie Royale des Beaux Arts in Antwerp, choosing the same course as his fellow Dublin colleagues Roderic O'Conor and Henry Allen. The following year he became the first Irishman to win the coveted annual Concours - the Academy's top competition in the category of human figure-painting. He remained in Antwerp for another year - before returning to Ireland in 1884 where he married his cousin, Suzanna Moynan. 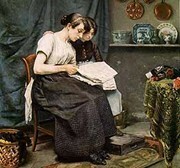 Examples of genre painting which he completed around this time include: The Reading Lesson (1884), Girl Reading a Newspaper (1885), and The Laundress (1885), all executed in the highly academic art style of the Dutch seventeenth-century. In 1886, again like other Irish artists before and after him like John Lavery and Paul Henry, Moynan went to study at the Academie Julian in Paris. Here he experimented with lighter colours and freer brushstrokes. Later that year he returned to Dublin and established himself as a professional artist. He became an organizer of the Dublin Art Club as well as President of the Dublin Sketching Club, and continued to exhibit in the Royal Hibernian Academy. Artworks from this period include: We Hope We Don't Intrude (1887) and Taking Measurements (1887). The auction record for a work by Richard Thomas Moynan was set in 2006, when his genre painting, entitled Tug Of War, was sold at James Adams, in Dublin, for €270,000.  For more about traditionalist Dublin artists like Richard Moynan, see: Irish Art Guide.  For more about genre painting, see: Homepage.